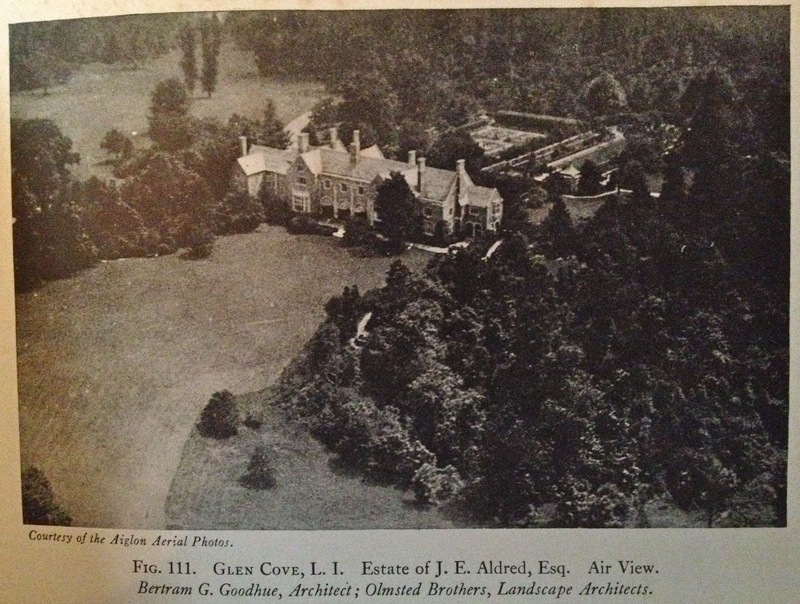 An aerial of 'Ormston', the John Edward Aldred estate designed by Bertram G. Goodhue between 1913-1918 in Lattingtown. Click HERE to see the brochure from when 'Ormston' was for sale. Click HERE to see the estate on google earth and HERE on bing. Photo from American Country Homes of Today, 1928. Although Tudoresque architecture typically doesn't appeal to me, this house and property are pretty spectacular. And, very thankfully, it is kept in near perfect condition by the Monks who reside there now. Apparently, Aldred weathered the Depression fairly well, but came a cropper in the late 1930's when utilities investments he had made in Germany and/or Italy were nationalized (I have never been able to uncover definitive proof of this, but the basic story has been repeated to me so many times and by so many disparate sources, that I believe that it is in large part correct). In any event,a grandson of George Baker who lived directly next door to the Aldreds told me a story that has always haunted me: On the eve of leaving Ormston, with the auctioneers due the next day, Aldred called his neighbor George Baker to ask if, perhaps, the Bakers might like to purchase anything from Ormston before the sale. George Baker apparently answered with a very curt "No" and hung up the phone. The Baker grandson attributed it to the fact that the Aldreds were viewed as not sufficiently grand by their neighbors. It is a strange commentary on American snobbism where a fortune made one generation previously would look down on the self made man. It has ever been thus in the social wars---last one in tries to close the door behind him. Even in our little village, one sees amazing examples of inexplicable snobbery and cruelty---often by people who are of inferior human qualities despite their 'standing'---who often as a result miss out on some interesting people. The current social war in our town is a rich, and very nice couple, whose crime is building a large dock---their neighbors on either side are trying to block it, in a shockingly mean and rude way, with nasty public statements, and attempted blackball at the yacht club. As you may have guessed, both neighbors already have docks. Hypocrisy plays a huge role in this game. From his recent top to bottom, room to room, exploration of Ormston House I have to say this is one Gilded Age manse I don't worry about being lost in the near term. The religious order has done a far better than average job to retaining the estate feel without leaving a viewer the feeling its become institutional. The Poor House in Tuxedo Park, which served as a nunnery for many decades, is another such example of it being kept in tact. Two majestic estates. Two days in a row. Both extant, well preserved and fully in use. It is a great day. Add in Clayton from earlier in the week and it is a great week. Thanks Zach! About 15 or 20 years ago, The Woolworth Corporation, by then Foot Locker, was vacating the last of its offices in the Woolworth Building, and they sent to William Doyle Galleries the entire contents of Frank Woolworth's office which they had apparently kept in storage since the old man's death. It was an amazing collection of very heavily carved and elaborately upholstered furniture in the Empire style, and included Woolworth's gold colored stick telephone. Pretty it may not have been, but it was an astonishingly complete example of over the top plutocrat taste of the last century. I only wonder what they did with the marble walled office itself. Although for the record it appears that Richard Woolworth's Westchester Co. mansion 'Northshire' (on the market now) by Mott Schmidt in 1934 is sans any marble. Go figure. That North Salem property is quite an elegant home built in the midst of the great depression. Presumably the families finances were not severely impacted by the times. Magnus, a link showing a number of interior photos and to the office as it appeared in 2011. Looks like the interior should make a spectacular apartment. TDED, as you well know, it was the Woolworth's family compound in Monmouth, Maine, that was famously robbed of dozens of paintings back in 1973 by New England's most celebrated thief - Myles Connor. While works by Andrew Wyeth and NC Wyeth were filched, Connor missed out on the mega treasure trove of works by Mary Cassatt, Winslow Homer and Childe Hassam among others. Those painting were on display elsewhere on the compound. The compound was built in the 1920's, and had been at its height centered on several hundred acres with 26 buildings, including horse stables, a private theater, and a bowling alley. Thank you Archibuff. I wonder where in the building the office was and what if anything survives. And Magnus- "period" rooms seem to be wholly out of fashion with museum curators today, dismissed, and probably rightly so, as the pastiches that almost all of them are. I was recently at a talk given by an eminent historian during which the Wrightsman Rooms at the Metropolitan Museum, deeply beloved by so many, including me, received a scathing review as not museum worthy. Sad then, as you point out, a virtually intact interior like Woolworths office, should slip through our fingers. Absolutely a fantastic collection of aerials. Really shows the estates and their surrounding gardens, mature landscaping and neighboring farms and the overall rural character of Long Island at the turn of the twentieth century. Amazing views of Knollwood and Harbor Hill surrounded by a virtual forest. Thank you for the Aiglon Aerial Photo Collection. I am going to be quite busy for the next hour looking through all of them. The Aiglon link included a picture of the Frederick Vanderbilt estate at Bar Harbor, invaluable to me at the moment, so thanks! In yet other news, the current issue of Architectural Digest features the very respectful renovation and update of the Ogden Phipps House by Delano & Aldrich. For once not a gut job, interior details intact and respected. The kitchen was gutted and the half floor servants wing was eliminated to give the ceiling twice the height. But if you had seen the former kitchen you would agree it was necessary to remove. Plus it had a handful of extremely vintage appliances. Looks like they kept the wallpaper in the dining room too. I cannot image the jaw dropping impact these grand estates - from the architecture to the landscapes - must have had upon those seldom few who could view them from above. Already limited in the number of persons who had entry to them, during their zenith, the number of aerial viewers who could see just how sprawling they were from above were even fewer. Zach, I love the old servant run kitchens in these houses, but wouldn't want to cook in one. I think the new vaulted ceiling room is quite handsome. Interesting shot of Ormston and lots of wonderful links today. Kellsboro - I am ready to move right into that Mott Schmidt house! Anon 7:49 have been mesmerized by the Aiglon photos for 30 mins. now have to look again - thanks! DED - The Ogden Phipps house re-do is super - I feel like I have seen pictures of the original interiors somewhere but I can't remember where....? Chip SF---you probably saw the original interiors in the real estate listing ads a year or two back. Also, there are some shots of the empty, yet to be renovated rooms in Steven Gambrel's book, published last year. Re: Welwyn, I always wondered about the gardens down the lawn towards the pine forest. 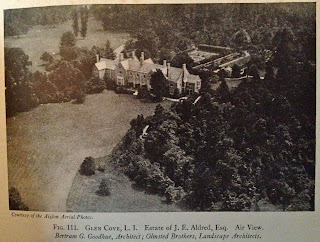 I just discovered a article in Country Life April 1933, "The Gardens of Welwyn", but would love to see an aerial photo or diagram of the gardens, they must have been wonderful. I remember back in the late '60s when the monastery used to hold an annual fair open to all. I especially loved the teahouse above the garden and tunnel beneath it. There also was a large walled garden with a viewing tower at one corner. I loved the dramatic entry gates opening to the courtyard, with a glass lantern suspended over the gate arch. A timely aside, sorry about veering off course, the current issue of Town & Country magazine has a feature on the younger generation of Woolworth heirs who stay up at the Monmouth, Maine compound. During the annual Fair tour we were told that the wood paneling in the great hall came from Sherwood Forest.